Every hazmat pro knows a Dangerous Goods shipment that doesn’t comply with current regulations could end up costing their company money. In fact, 28% of hazmat pros surveyed in our 2018 Global Dangerous Goods Confidence Outlook said their companies comply with regulations only because the regulations mandate it. In other words, all they want to do is not get fined. Unfortunately, fines and penalties are only one small part of what compliance gaps can cost a Dangerous Goods shipping operation. And most operations don’t have an accurate picture of the complete costs. When you don’t understand what non-compliance costs you, you can’t effectively prioritize your compliance spending. Which means you can’t run at maximum efficiency—and that hurts your bottom line. How can you determine your costs of non-compliance? Our free Total Value of Compliance Assessment has three parts, and part 2 is all about determining what compliance gaps truly cost your operation. The costs of compliance. 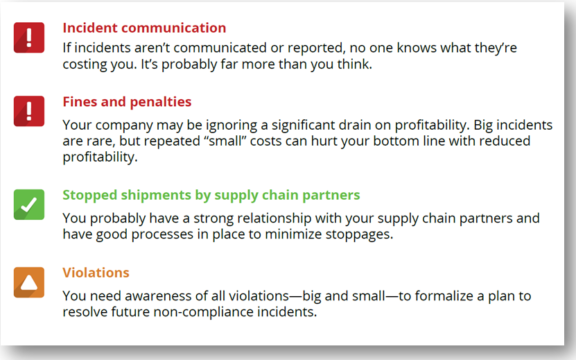 The actual cost of maintaining compliance throughout your supply chain. The costs of non-compliance. The cost of errors or lapses in compliance. The revenue opportunities of higher-level compliance. Opportunities for market leaders to differentiate, increase revenue and speed cash flows. The Total Value of Compliance Assessment helps you and your Labelmaster account executive evaluate and improve your organization’s TVC. And the higher your TVC, the more profitable your operation can be. What’s even harder to predict and calculate is the negative impact non-compliance can have on customer loyalty and the value of your brand. If a small infraction delays a critical shipment in customs, for example, what’s the likelihood of that customer turning to your competitor for the next shipment? And what can that cost your business? Many operations can’t address these issues because they’re not tracked as discrete line items—or they’re not tracked the same way from one location to another. 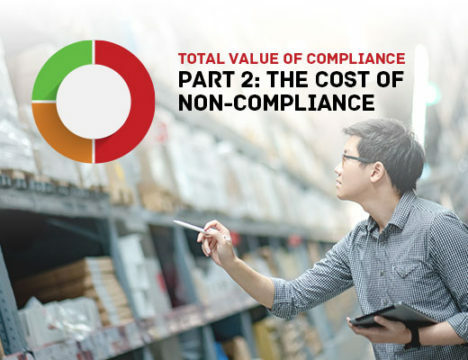 Part 2 of the Total Value of Compliance Assessment asks the questions that will help you determine the complete costs of non-compliance across your operation. These aren’t yes-or-no questions—they’re open-ended conversation starters that can reveal weaknesses you didn’t know you had and opportunities you may never have considered. The conversation will probably take about 30 minutes. These results are more than simply information you can use to improve your TVC. When you can demonstrate the full magnitude of the costs your company incurs for Dangerous Goods compliance errors, you have the ammunition you need to persuade your management that improved compliance is worth pursuing. For more detail about TVC and how you can apply it, download the Total Value of Compliance Technical Brief today. If you’d like to take a free TVC Assessment, call your account manager or contact Labelmaster Marketing Manager TJ Harvey. Labelmaster is a full-service provider of goods and services for hazardous materials and Dangerous Goods professionals, shippers, transport operators and EH&S providers. See our full line of solutions at labelmaster.com.